Immediately following the closure of the Port Pirie gazette, Walter South established the town's second newspaper, the Port Pirie advocate, later assisted by his brother Alfred. From the beginning the Advocate was outspoken on political issues. Letters to the editor were welcomed to the point that one regular political correspondent, Andrew Dungey, was given his own column. However, later letters were discouraged and even criticised by the editor for their "silly arrogance" and "heavy and uninteresting" content (9 June 1893, p. 2). The newspaper also gave good coverage to sport, a feature which grew from this period across most of Australia's country press. Political opinions Early editorials reflect the strong socialist views of the owners. "The land question" voiced the editor's particular beliefs about democratic land ownership (4 April 1885, p. 1). Comments by the Anglican Bishop about "land monopolies" (17 February 1888, p. 3) and a speech by the Reverend Dr James Jefferis about the discrepancy between rich and poor (24 February 1888, p. 3) were published to lend weight to the argument. In 1893, when 200 local men were unemployed, the Advocate wrote, "There must be a prodigious blunder somewhere, when in a country containing millions of square miles of unoccupied land...we should be confronted on every hand by men, women, and children engaged in a bitter struggle for a bare existence" (9 June 1893, p. 2). The local stationer, Andrew Dungey, wrote regularly to the Advocate, voicing his strong opinions on these ideas of "land nationalisation." Influenced by Henry George's theories of (Christian) Social Democracy, Dungey wrote prolifically and obviously received feedback. "At least half a dozen fellow townsmen have personally taken exception to the manner adopted by me..." he wrote in 1888 (23 March 1888, p. 3). Between March 1888 and February 1890, Dungey contributed his own "weekly bulletin" on the back page of the Advocate, enlarging on his beliefs. Dungey stood, unsuccessfully, for Parliament in 1890, and for a short time in 1891 published his own purely political newspaper, Roughshod. Between 1893 and 1894 the Advocate reported on the experimental New Australia community in Paraguay as well as the local Village Settlement movement. Supportive of the emerging Labor Party, in 1898 the editor wrote, "we speak as liberals strong and sincere" (27 May 1898, p. 2). The Advocate views seemingly reflected local opinions, for example in 1897 a public meeting discussed means of raising money to assist the striking bootmakers of Adelaide (9 April 1897, p. 3). Russian invasion fear In 1885, during growing friction between Russia and Great Britain, South Australians prepared for the second time for the possibility of a Russian invasion. As a shipping and manufacturing town Port Pirie felt particularly vulnerable and a local defence force was formed. "At such a time as the present, when war seems to be inevitable, it is the duty of every citizen to qualify himself... In the event of a Russian fleet coming round to Wallaroo for coaling purposes, a cruiser would probably run into Port Pirie...The name Port Pirie cannot but be well known to most Europeans..." (29 April 1885, p. 2). 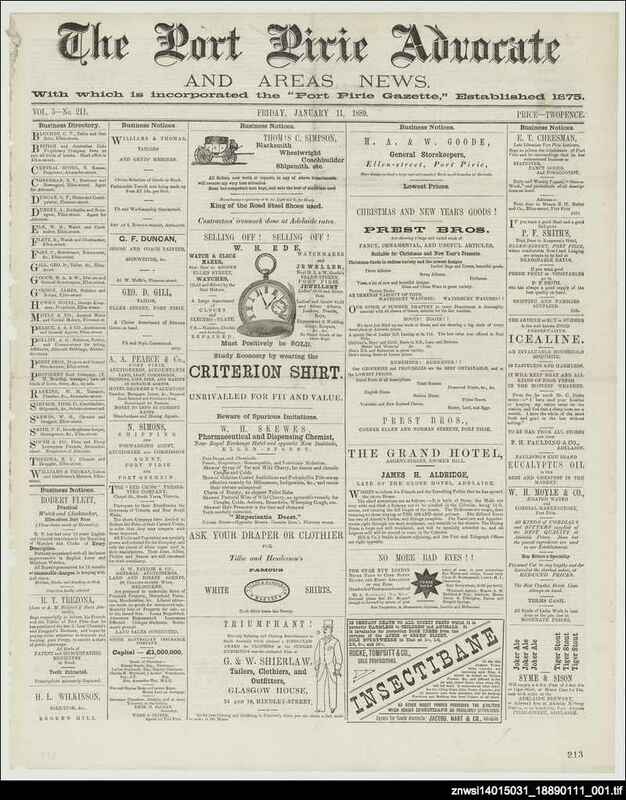 Geographical coverage Like most 19th century country newspapers, the Advocate carried news articles contributed by writers from both small and large settlements around Port Pirie. News was included from Broken Hill, as far south as Kapunda, and up to Port Augusta. However, the most regular reports came from the towns of Caltowie, Wandearah, Port Germein, Petersburg and Kapunda. These local news reports had become intermittent by the 1890s. Sport From 1886 the Advocate carried a column, "Sporting notes by Dagworth." The following year "Observer" began writing rowing notes. An interesting discussion through June and July 1885 centred around the lack of female spectators at football matches through letters to the editor. In the later years of the newspaper a cycling column (by "L.A.M.P.") reflected the popularity of this sport - the local club had over 60 members (9 April 1897, p. 3). Ownership The Gazette was established by Walter Brown South and Co. and from the fifth issue, South's brother Alfred was named as partner. A year later, in April 1886, Alfred South became sole proprietor. In April 1898 he formed a partnership with Charles Meyrick of the Port Pirie standard. The newspaper ceased three months later when the two titles were combined to become the Port Pirie recorder.